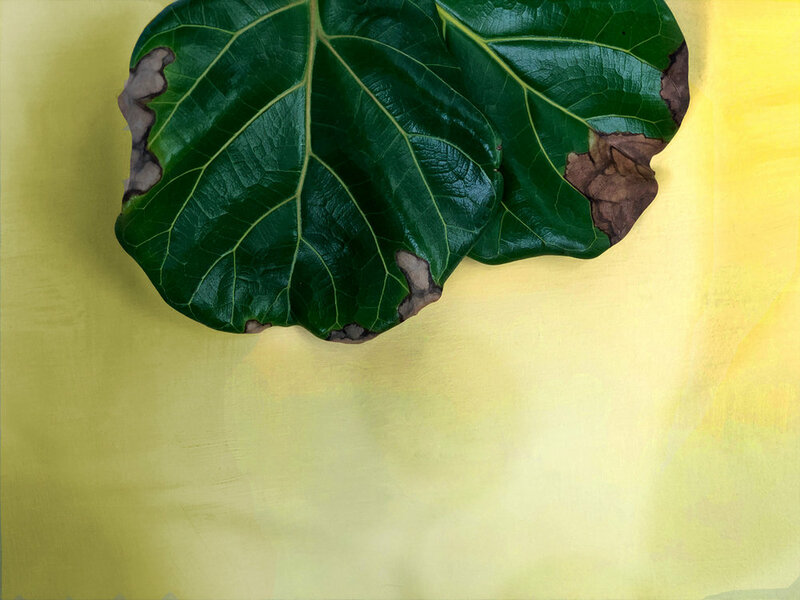 It's no surprise that the the Fiddle Leaf Fig has risen to the top of the most wanted indoor plant list, with its structural leaves and ability to transform almost any space into the likes of a magazine shoot. These big bold beauties can be picky though, and most owners experience brown spots despite perfect maintenance routines and all the sweet talking they can muster. Read on for the three most common causes. Overwatering - Darker brown spots around leaf edges and centers will form from getting too much water. Overwatering and keeping the soil moist will cause the roots to rot and can lead to fungal infections. Check under your plant for drainage and standing water ASAP. Allow soil to dry completely through between waterings. In extreme cases, change out the soil. Dryness - Light brown spots (as pictured) will form around the edges of leaves from a lack of water, or too much direct light. A bright spot next to the window, but not in the path of harsh direct sunlight or any heat source is best. Refresh your tree by giving it a thorough shower, letting the water run through the drainage holes. When time to water again, add 1/2 cup to your typical amount and check every 5-7 days to see how fast your plant is drinking and drying. Insect Damage - small dark spots that eventually turn into holes, this type of browning can often be found on new growth. Luckily, this isn't very common and is easy to treat. Look out for insects or webs on the undersides of the leaves. Spray both sides of the leaves and along the stem with Neem Oil, a natural fungicide that kills bugs, larvae, and eggs. Wait two weeks, inspect for further evidence of insects, and repeat if necessary. A lush and sculptural plant with elegant violin-shaped leaves, the Fiddle Leaf Fig Tree makes for a dramatic addition to any indoor space – truly a must-have for all who appreciate style and greenery.